You finally get a chance to clean the house, and you begin to vacuum your carpets; however, all of a sudden the vacuum cleaner isn’t picking everything up anymore, and it starts to smell like it’s on fire. Or maybe you are running late one morning, rushing to get your clothes out of the dryer only to realize that they aren’t fully dry. Or perhaps you just put something in the oven for dinner only to check on it and realize that the oven isn’t getting up to the proper temperature. These scenarios are all too familiar for many people. The question to repair or to replace a malfunctioning appliances is one that you will eventually have to ask yourself—if you haven’t already. Since modern appliances make up the foundation of our lives, a broken major appliance can cause you and the whole family a lot anxiety. So unless you are okay with cooking your food over an open fire and cleaning your clothes by hand, the best time to take care of a malfunctioning appliance is before it completely breaks. That’s why Yost Appliance repair recommends these 4 end of summer appliance repairs. Washing Machine Direct Drive: Replacing the direct drive inside a washing machine is a pretty simple and straightforward repair that can make your washing machine run like new again. Indication it’s time for a repair: washer doesn’t run, won’t agitate or spin properly, doesn’t rinse fully, and/or leaks water. Drier Repair: We repair all brands of Washers & Dryers in Santa Barbara. Call if: My dryer isn't heating; My dryer won't start; My washer is leaking; My washer won't spin. Our team will fix broken wiring that has become dangerous and repair any knobs that won't turn. Refrigerator Cooling Issues: A faulty refrigerator may cost you a fortune in spoiled food and can put your entire family at risk for food poisoning. There are a whole host of causes for cooling issues, so trust Yost for your refrigerator repair in Santa Barbara. Indication it’s time to call Yost: fridge not cooling properly, defrost not functioning, fridge emits noises and/or runs consistently. Dishwasher Repair: Perhaps nothing elicits such sighs of relief than being able to fill a dishwasher full of dirty dishes and not have to even get your hands wet. Ah the joys of modern life, but these creature comforts and easily turn into headaches. Indication that it’s time for a repair: dishes aren’t getting fully cleaned, dishwasher isn’t draining fully, water isn’t reaching temperature and/or leaking water. Don’t wait until your appliance breaks down, causing headaches and costing you time and money. Be proactive, you can save yourself money by repairing appliances before they fully breakdown and have to be replaced. A repair today can save you money tomorrow. Don’t replace. Instead repair. 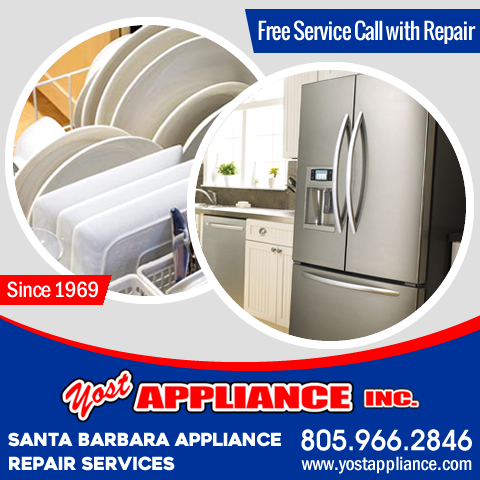 Call Yost today at 805-966-2846 for Santa Santa Barbara’s best appliance repair services. We are the oldest appliance service company in the area, since 1969. A call to Yost today will save you money tomorrow. Yost Appliance offers dishwasher repair, refrigerator repair, freezer repair, washer and dryer repair, range repair, oven repair and garbage disposal repair. We service a long list of brands. Call us today at 805-966-2846 to schedule a service call. All service calls are not charged with repair. Same day service and senior discounts are also available. Thank you for your continued support and we look forward to helping you with your appliance repairs in 2017. We'd like to thank our customers for continuing to call us for their appliance repair needs. “Mr. Yost gives good old fashioned service. Thanks for the years of good service. "- Lois Capps, Washington D.C. It is comments like these that have helped us remain successful. We want to truly thank you for choosing Yost Appliance for your repair needs throughout the year. We value the trust you put into our technicians. We look forward to serving you in 2017! p.s. As a resource to you, each month we will recommend local area partners that we feel may be of value to you. Rosie's Cleaning is a great local cleaning company worth considering for a little extra help with your holiday cleaning tasks. If you are relocating over the holidays, and need the help of a professional movers, call Hazelwood Allied Moving and Storage, a reliable moving company in Santa Barbara. Q: Do you offer specials offers or discounts? A: Yes, we offer special offers and discounts on our Facebook page and in our newsletter. The best way to keep track of offers is to check the website and follow us on Facebook. Q: Do you offer a satisfaction guarantee? A: Yost Appliance has been in business since 1969, we pride ourselves on having the highest number of satisfied customers in the area. In the event you are not happy with your service, we will discuss the repair with you and work with you closely until you are 100% satisfied. We offer a 100% satisfaction guarantee. 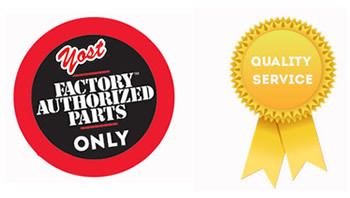 Q: What areas does Yost Appliance service? We provide same-day appliance repair services for clients from all over Santa Barbara, Goleta, Isla Vista, Hope Ranch, Montecito, Summerland and Carpinteria. Q: Why is my dryer making a high-pitched, screeching noise? That means your belt probably needs replacing, but be careful, there are dangerous high circuit wires inside a dryer that can give you a serious electric shock if you don’t know what you’re doing. 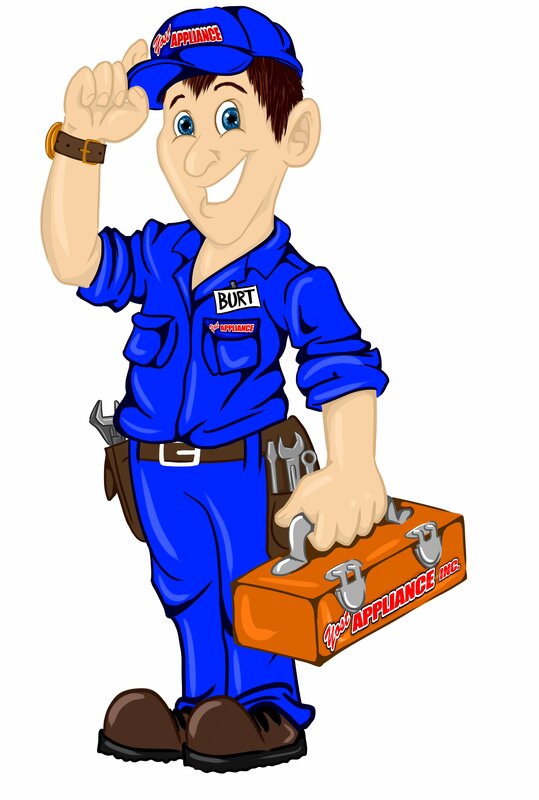 Always hire a professional to safely repair your appliances; you can contact Yost for help. Q: Is your company insured? Yes, Yost Appliance is fully insured and licensed. In addition, all of our technicians are professionally trained to provide you with a first-rate service. We’re so confident that we offer a 100% satisfaction guarantee. 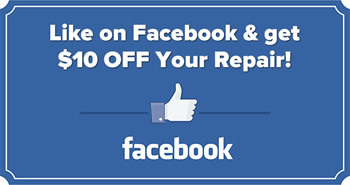 Get $10 OFF Your Repair! *must mention at same time of service. Can only be redeemed once. Yost Appliance, Inc. offers same day service on almost every make and model of home appliance on the market. 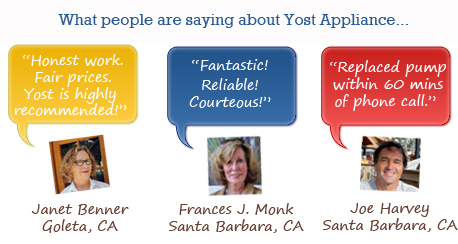 Find out why customers are willing to provide so many testimonials about the service they receive from Yost Appliance. 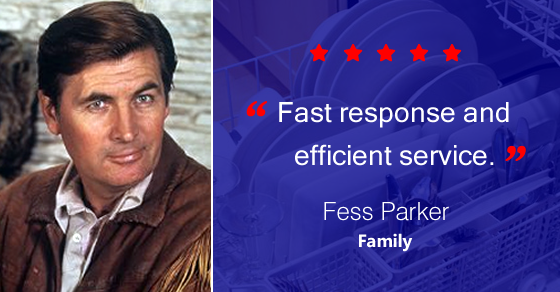 Comments like, “Honest Work, Fair Prices” and “Fair, friendly, honest and locally owned” are strong indicators of the level of service you can expect when it comes to appliance repair services, oven repair, washer and dryer repair, refrigerator repair, and garbage disposal repair. 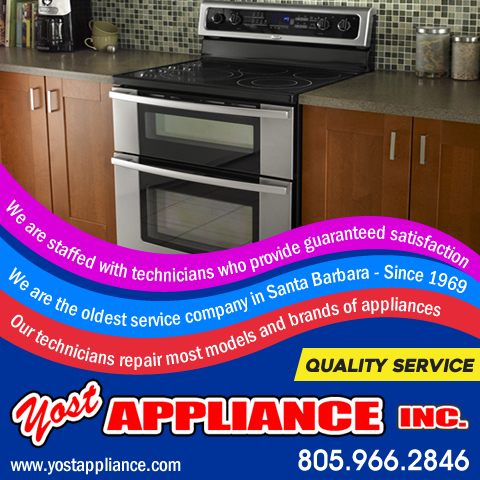 I have heard great things about your appliance repair services in Santa Barbara! Looks like you guys offer same day service for appliance repair, so many in town are not offering same day service. I will be calling you tomorrow. It says you offer senior discounts for appliance repairs, which I appreciate! 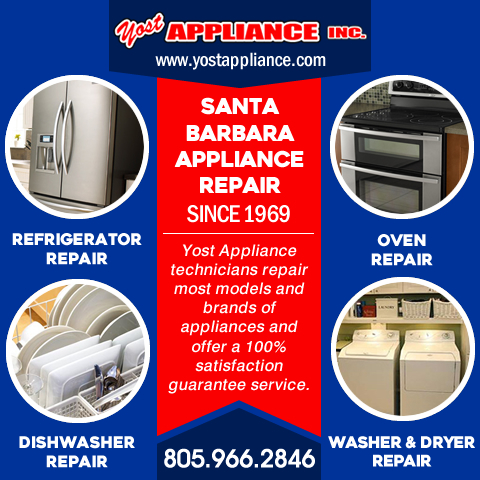 Yost appliance is the best appliance repair company in Santa Barbara, you guys are the best when it comes to same day service and friendly customer service, i always choose yost for my appliance repairs! As part of appliance care, it is important to get immediate help when a problem is detected. Get qualified help for washer and dryer repair, refrigerator repair, or garbage disposal repair. Operating faulty appliance can lead to more damage, and can even put your home at risk. One thing I realize after reading this article is that preventive maintenance is really important to avoid appliance breakdown. Nevertheless, it's good to know that there is a reliable and efficient Santa Barbara appliance repair company to call to anytime.